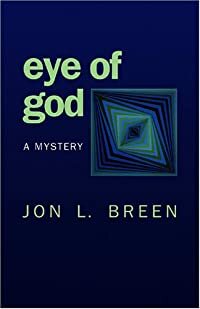 Eye of God by Jon L. Breen, a Mysterious Review. Review: Jon L. Breen adopts a no-holds-barred approach to characterization in Eye of God, a remarkably absorbing mystery of private investigators, tele-evangelists, atheists, and lawyers, set in southern California's Orange County. Evangelist Vincent Majors, head of a powerful television network, believes someone from his inner circle is leaking secrets to his enemies, information that may be damaging to the integrity and financial well being of his ministry. The private investigation firm of Hasp and Carpenter (Breen has cleverly named the partners and is clearly having a bit of fun here), who Majors has hired to uncover the traitor, has also been hired by Majors' daughter to look into an unrelated personal matter that presents no apparent conflict of interest for the firm. When one of the people under investigation is murdered, it's clear these cases have more serious consequences than they may have initially appeared. Despite the potential for controversy, Eye of God is not pro- or anti-religion. Rather, murder and mayhem can take place in any profession and in this case, the venue is a television ministry. Breen is careful to imbue his characters with features that are entertaining, but not overly stereotypical. The narrative moves along at a brisk pace with a credible whodunit emerging about half-way through. The ending is a bit weak, but overall, combining solid character development with effective dialog and a competent plot, Breen has written a most enjoyable mystery. Acknowledgment: Perseverance Press provided a copy of Eye of God for this review.